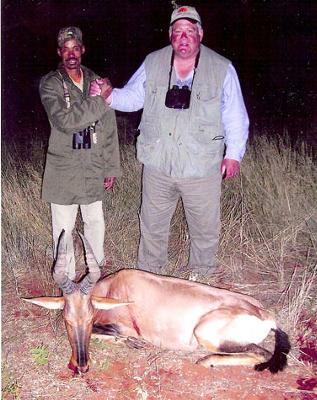 In August of 2007 I was hunting on Joss's Farm in Northern Namibia with Joss and my Professional hunter, Barry. We had seen many animals on this very special Farm near Etosha National Park. We had encountered Blue Wildebeest, Burchell's Zebra, Springbok, Eland, and Gemsbok in quantity. However I was after the magnificent Antelope called the Red Hartebeest. The sun was setting and the sky took on a red and orange glow. The grass and trees were well defined in the receding light. We came to a large field of long yellow grass. Across the field was a grove of Mopani trees. Underneath the Mopani trees we spotted a herd of Red Hartebeest. The Hartebeest were about 200 yards away. Barry and Joss conversed in Afrikaans. Barry pointed to a Hartebeest with large horns. He said it was a bull. I looked at the animal through my scope and decided to take a shot at 200 yards. Whuump!! At the shot, the targeted Hartebeest dropped. The rest of the herd ran in all directions as fast as the wind. We went up to the fallen Hartebeest. Joss and Barry started to laugh. I wondered what they were laughing about. It happened that the Hartebeest that I had shot was a large horned cow, not a bull. Joss and Barry were laughing because they thought it was funny that they could not tell a cow from a bull. I was entirely satisfied with my trophy; however, deep within I knew that I had to come back to Africa and harvest a bull Hartebeest. In May of 2009 I was at Uitspan Hunting Ranch in the Kalahari Desert of Namibia. With Michael Duvenhage as my Professional Hunter I had taken quite a few Gold Medal animals. I told Michael that I would like to try for a bull Red Hartebeest. In early May, when I was in the Kalahari, it had rained for two straight days. Rain was very unusual in May in this Thirstland of Southern Africa. The red sand was moist and it was easy to track animals that were stalked or wounded. Michael says that he never loses a wounded animal in the sands of the Kalahari. awaited the bull. The bull picked up speed and began to run towards us. He was very swift. Our vision was obstructed on the left and on the right by Acacia trees. The bull ran right by us at top speed. We saw him clearly for an instant. I never had time for a shot and Michael did not tell me to shoot. It would have been a running snap shot at best. The Hartebeest was gone. The rain began to fall very heavily. My hunt for a Red Hartebeest was over on Uitspan. After my hunt at Uitspan, Michael and his wife, Tienie, brought me to another hunting ranch near Windhoek. I was introduced to Jan and his wife Marie and their two Namibian borne Professional Hunters, Franz and Johannes. I told Jan that I was mainly interested in Eland, Black Wildebeest, and Blue Wildebeest. I sat over a large waterhole for three evenings awaiting an Eland. We used alfalfa, Acacia pods and water as bait for the Eland. We saw other game such as large Warthog, Impala, and Black-backed Jackal come to the water, but Johannes restrained me from shooting. We were after Eland. There was much moisture in the plants and on the ground and the Eland did not have to utilize our bait. We finally resorted to Plan B for the Eland and ended up stalking him. We spotted a herd of Eland which contained a bull. Jan appraised the bull Eland with a practiced eye. He said we could do better. I wanted this bull Eland because I had hunted hard for four days and was not sure that I would get another chance. I took the bull and as luck would have it, he scored Namibian Gold. I was elated! We also harvested a nice Blue Wildebeest and a Namibian Game Fields Medal Black Wildebeest. There was still time left in my hunt so we decided to hunt a Red Hartebeest. I told Jan that I wanted a bull Hartebeest!! We hunted the whole afternoon with only glimpses of Hartebeest at a distance. I never got a shot. In the gathering twilight we pressed onward in our pursuit of Red Hartebeest. The sun began to swiftly set and it was becoming dark. It was almost time to go back to the Ranch House. In the receding twilight we came upon a herd of Hartebeest. A large Hartebeest stood still long enough for me to gather the animal in the light catching lenses of my scope. He looked like a bull. I took careful aim and slowly squeezed the trigger. Whuumpf!! A good solid hit. The Hartebeest ran off in the darkness. We got in the Toyota and attempted to find the Hartebeest. "Stop!!" cried Johannes. We had almost run over the Hartebeest. It lay belly up in the darkness in the long grass. We got out of the Toyota and Jan performed the Old German Hunting ceremony. We took pictures and measured the animal. He was a Namibian Gold Medal bull! At long last I had a bull Hartebeest! Back at the ranch house I sat at the bar and Jan treated me to a shot of Jack Daniels. "Prossit!!" Jan only gives his Jack Daniels to successful hunters for that day. It had been a wonderful day that I will never forget! Yet another cool story. I enjoyed reading all your hunting stories. You should pursue making a whole book of your hunting stories. Thank you for telling this story of your quest for a Bull Hartebeest. I liked the story of how you went back two years later to find the animal that you wanted as your trophy. The picture of the red hartebeest is impressive with the horns so perfect.